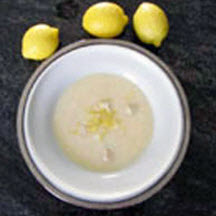 A delicious rendition of the Greek pastel yellow, citrus-flavored soup, Avgolemono. Fresh minced dill, basil, cilantro or tarragon stirred in just before serving complements this soup nicely. In a large nonreactive saucepan or Dutch oven, bring the broth and chicken to a boil over medium-high heat. Gradually stir in the rice, keeping the broth at a boil; reduce heat and simmer, covered, until the chicken and rice are done, about 20 minutes. Remove the pot from the heat. In a small bowl, whisk the eggs to blend. Gradually beat in the lemon juice. Slowly whisk about 1 cup of the hot soup into the eggs. Stirring constantly, gradually pour the egg mixture into the soup. Return the pot to the stove and cook over low heat, stirring constantly, just until the soup is thickened slightly, about 1 minute. Do not let the liquid come to a simmer, or the eggs will curdle. Serve immediately. Garnish servings with lemon zest, if desired. Nutritional Information Per Serving (1/6 of recipe): 163.3 calories; 20% calories from fat; 3.6g total fat; 92.4mg cholesterol; 812.0mg sodium; 355.5mg potassium; 14.2g carbohydrates; 0.2g fiber; 0.4g sugar; 14.0g net carbs; 16.8g protein.